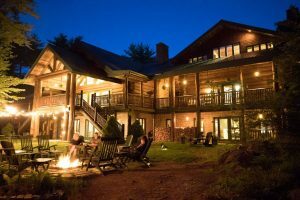 Less than an hour’s drive from where I live in Southwest Nova Scotia, there are two wilderness lodges: Trout Point Lodge, located east of the village of Kemptville, Yarmouth County, and Birchdale, located north of the same village. Think: opulence versus bare bones. I recently had the pleasure of being a guest at Trout Point Lodge courtesy of Yarmouth & Acadian Shores. Aside from receiving accolades in the New York Times, National Geographic Society, and Luxury Travel Magazine (to name just a few), it’s also a member of Small Luxury Hotels, a collection of high-end establishments world-wide. Out of 55 members in all of the Americas, it’s the only Canadian listing. Yes, it is wildly luxurious. But what I especially appreciate is the lack of pretentiousness. The new owners, Patrick and Pamela Wallace are down to earth as can be—as are the staff. You may arrive as a stranger but you will leave feeling you are part of the family. 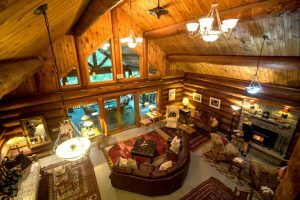 You may want to look into Trout Point’s special packages available now to mid-September. For example, for $1459-$1499 (plus 18% resort fee and 15% HST) you can combine two nights of luxurious accommodations and cuisine along with unique, themed activities. While I was there, I met the Graham family, visiting from Malvern, Pennsylvania. 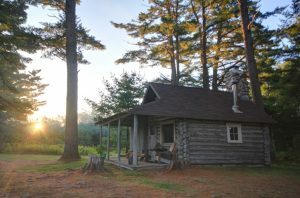 Christina Graham discovered Trout Point Lodge while doing a search on the Internet for a place where the family could enjoy nature and do some fishing. 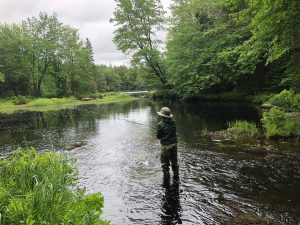 Although pickerel have taken over the Tusket River system, the Grahams had a guide who went the extra mile (literally and figuratively) to bring them to a good fishing hole. Now let’s slip into Birchdale. By using both brains and brawn, Helen Matthews (the owner) has kept the place open for the past 16 years in spite of not having any staff. It’s a gargantuan task as there currently are 18 buildings, including a handsome lodge dating back to 1910. Log cabins were then added for “sports” who came from the US to fish and hunt. 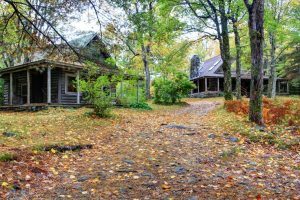 In the 1970’s and 80’s, monks from the Spiritual Life Institute in Arizona moved to Nova Scotia and turned Birchdale into a monastery called Nova Nada. They left in 1998. Helen bought the place in 2002, changed the name back to Birchdale, and encourages anyone who will appreciate the essence of the place to spend time there. She’s booked weddings, anniversaries and family reunions, along with yoga and photography retreats. 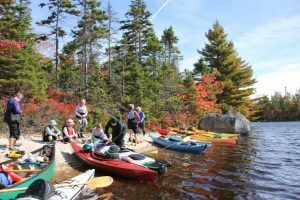 For the past ten years, I’ve organized a five-day women’s paddling “do” there, and, more recently, have set up writing retreats. It’s simply one of my favourite places on planet—likely because one of the guides at Birchdale taught me how to paddle a canoe when I was six, and paddling has been a big part of my life. Birchdale is also inexpensive; but remember that it’s bare bones. There is no electricity in the cabins although there are bathrooms with hot water and showers. Bring your own bedding and towels, as well as your own food. You can prepare and eat your meals in the main lodge, which has everything you need to cook and serve. Like to canoe or kayak? BYO. And a copy of Thoreau’s Walden wouldn’t go amiss. So there you have it. Wilderness at its best, served two ways in Southwest Nova Scotia. Why thank you Joesy! These are both such amazing places. Uniquely different yet oh-so-special. Sounds like amazing experiences in both places! Loved reading about the amenities (or not) in both, as well as the atmospheres encountered. Yes Cecil, the experience/atmosphere in both places beyond wonderful! Once again Sandra you have done a super job of describing our wonderful wilderness retreat places near Yarmouth. Of course Birchdale rates at the top for me as I have been going out there since the 1980’s. It’s a piece of paradise for me! Thanks for your excellent writing! Appreciate your kind comments Marilyn! THANK YOU!